How do you style a vintage midi skirt with Gucci Flair? What’s Gucci style about this outfit? The clashing scarf with the vibrant vintage blouse. I could have added a beret and funky glasses to punch it up even more. When I rescue fantastic secondhand vintage pieces like these and give them a second life it makes me so deliriously happy I’m known to randomly break out in song. Thank heavens there is no one here to judge me other than the pug. I think she may be tone deaf so we get along just fine. As a petite person, what trick am I using to avoid looking like a munchkin in this midi skirt? I’m only 5’4″ and a bit but I figure that little trick adds on at least two inches. The day I wore this to the AGO I bundled up adding a dark blue vintage leather coat, a wool beret and patterned scarf. The weather has taken an icy dip since these photos and it is hard to maintain any fragment of style when you are shivering uncontrollably, knee deep in snow, slush and salt with a windchill of -20 C.
Winter only recently arrived but I’m already WAY over it. 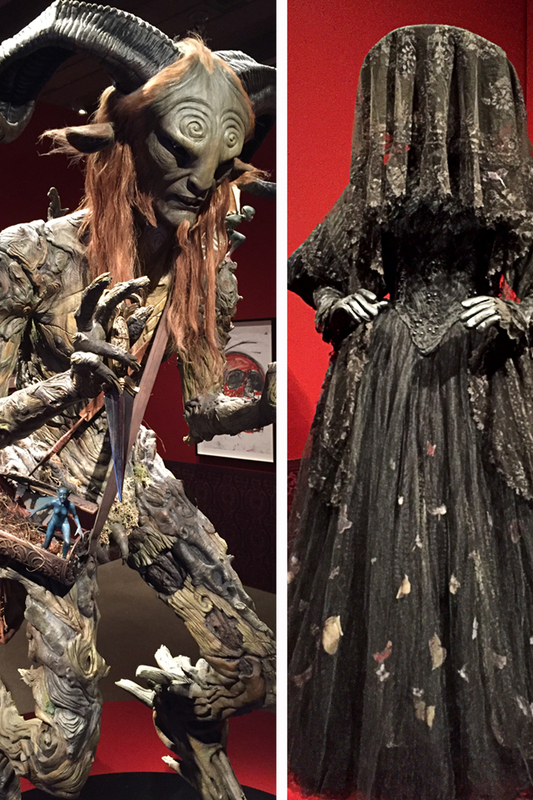 We went to see the Guillermo del Toro Living With Monsters exhibit at the Art Gallery of Ontario. It was fabulous! Can you imagine having a house that looks like this? I don’t think I’d be so keen if it were just me and the pug at night though. Plus I can’t imagine the team of maids required to keep it all clean. Here are a few more photos I took while enjoying the exhibit. Guillermo del Toro explained his penchant for moving the eyes on his monsters and putting them in unexpected places is meant to unnerve us. The eyes are considered the window to the soul and when displaced the creatures appear soulless. We can no longer judge their intent. The creatures that arise from del Toro’s imagination are cunning, intricate and terrifying. The costumes from Crimson Peak took my breath away. I read that the undergarments required to keep the shape of the dresses were numerous, heavy and terribly uncomfortable often restricting the movement of the actress wearing them. 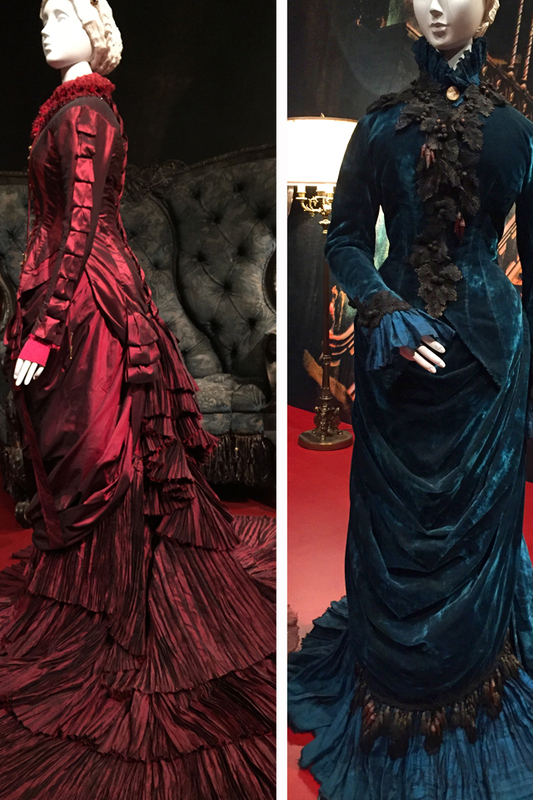 Victorian style dresses from Crimson Peak. The back of the red dress is designed to look like an external spinal cord. 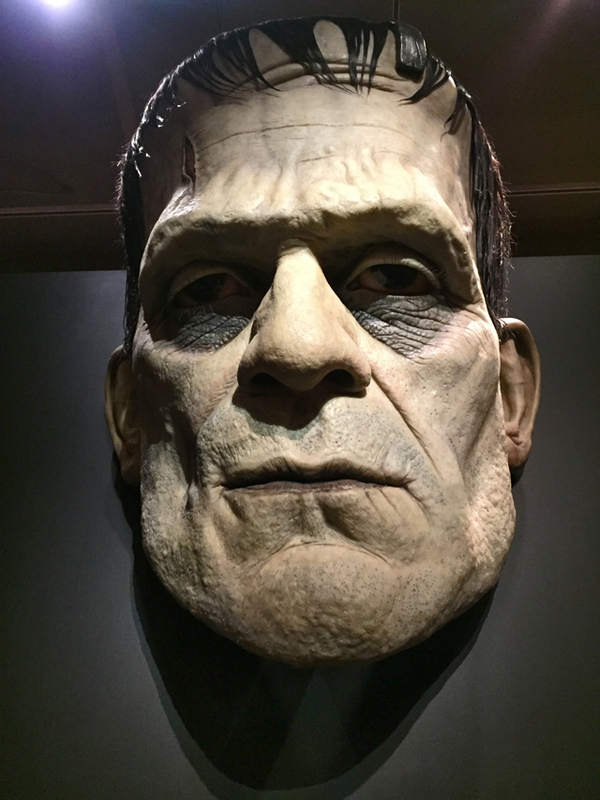 The massive Frankenstein head that hangs in the foyer at Bleak House del Toro’s home in California. Here I am in the comic book room, one of the many sources of inspiration for Guillermo. 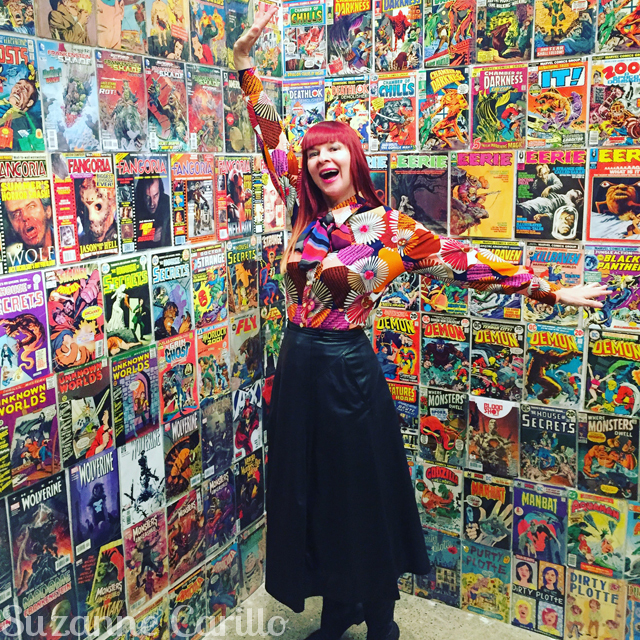 My vibrant blouse matches the bright comic book illustrations. I always find learning about artists, no matter their chosen media profoundly inspirational. Feeding our creative impulses keeps our imaginations and minds vibrant. P.S. I loved this outfit so much that I used the same clothing equation to create several other outfits that I’ll be featuring soon. Wishing you happiness and love in the New Year. Linking up to Visible Monday with the lovely Patti. Yeah, I don’t wish -20 C on anyone. please send this outfit to me, @koboldland/germany ! no – just joking, my valkyrie frame would never fit in. i really love the look – totally chic in my books – and this style suits you so well! love the bundled up version too. the exhibit seems something very interesting und inspirational – i often get inspired by museums, exhibits or movies. I think you would look fabulous in this outfit Beate! You look wonderful – that blouse is incredible on you and absolutely perfect for adding some extra Gucci-style glam to that fabulous leather midi. That’s the secret isn’t it? A long unbroken line – wide legged, floor skimming trousers, a maxi dress or a midi skirt with the same colour boots – add those crucial extra inches to us short arses. I don’t know how you survive minus 20 – I think you need a couple of weeks on a tropical beach. We just watched the Devil’s Backbone tonight and really enjoyed it. Can you imagine that initially I thought I was going to sell this blouse? I’m so glad I screwed my head back on straight and kept it. We have already booked our trip to Jamaica for a much needed beach break in March. Now I just need to hang on till then. I think this bitter cold is expected to move on. Normally our temperatures are around zero or a couple of degrees below. When it gets this cold no one wants to go outside. Girl, I want to be you. Or at least dress like you. That’d be enough. I’d live contentedly if I could wear clothes as well and stylishly as you do. You’re doing a darn good job at taking photos. I thought you were taller than me. Your styling was so good with this that I didn’t even notice that the scarf was an addition! The shirt is superb, such a wonderful vibrant colourway and perfect as you stood in the centre of that comic book display. I used to be 5ft 5ins, but think I may be pretty much the same height as you Suzanne. Don’t you hate that shrinking feeling? I think my Mom has dropped three inches now. She might be going all Benjamin Button on me and the next time I visit her she will be a toddler again. You look gorgeous in your leather midi skirt and that beautiful blouse! That exhibition looks fascinating but I have to say I found some of the exhibits extremely creepy! Hope you have a lovely and not too cold, Happy New Year! I never wore midi anything until a couple of years ago and then I became obsessed with it. Yes, del Toro’s films are quite creepy. His movies do a good job of actually making the humans look far worse and meaner than the monsters represented. U look amazing!!! Love the monster house!!! Fabulous combination ! Allesandro ( sp?) would be proud ! I agree, very Gucci, the perfect clashing compliment of the scarf with the blouse is excellent. circus, I mean — News..ahem… and then sob. Thank you for consistently pulling me out of that place! Frankenstein head as interior accent, why not? Hahaha! The Ghost Mother costume freaks me out the most. I’m a less-is-more gal when it comes to fright. You look amazing in that blouse with the bow – the comic-book-room photo is one of my favourite photos of you ever. We all want to hear you sing now! Happiness, love, light to you too, Suzanne. What a beacon you are in my world. I look forward to more adventures with you in 2018. I hope you have a stellar year. Loved your outfit, dear Suzanne, the pictures are great! I didn’t know about your height! I am 5’2 and a half and I want to keep that half 🙂 Ends up to be “fast” I say 5’3. I loved the skirt with the boots and yes, it seems to add some inches – I always thought you were taller! 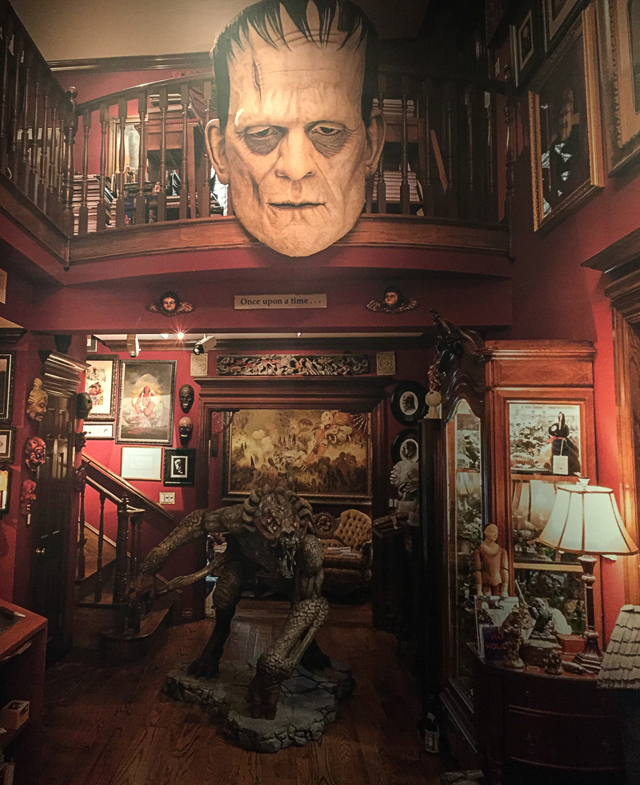 Guillermo del Toro exhibition is interesting, but you are right, alone in that house I wouldn’t be able to live! But you are again right, all nice to inspire us! I loved the comic book walls! And the Crimson Peak costumes! Hope you have a brilliant 2018!!!! Hugs! What a fabulous look—but how could you go wrong in leather??? It’s like being a rebel in a skirt??!! And even though I’m not a horror/monster person, you can certainly get some interesting inspirations from any kind of museum!! 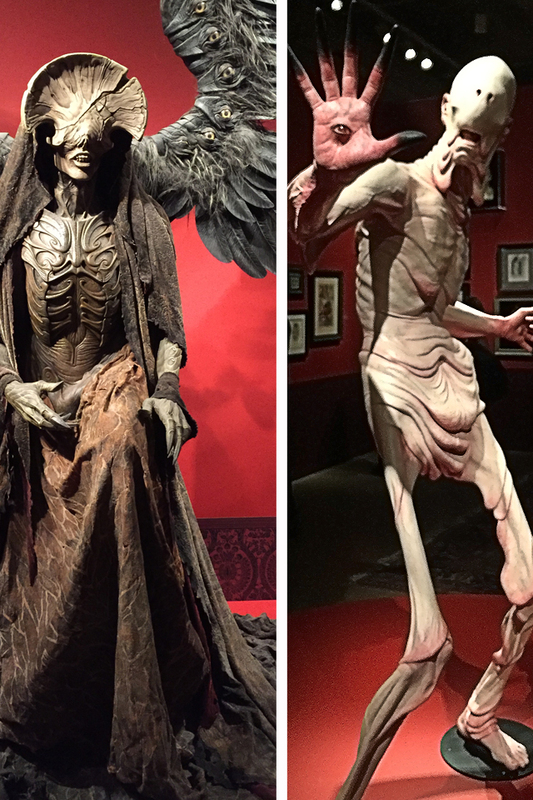 I’ll bet you really cut a swath of classy elegance as you swept through the rooms of the del Toro exhibit. The way you picked up on the stripes in the print of the blouse and replicated it in the scarf bow is so perfect Suzanne. 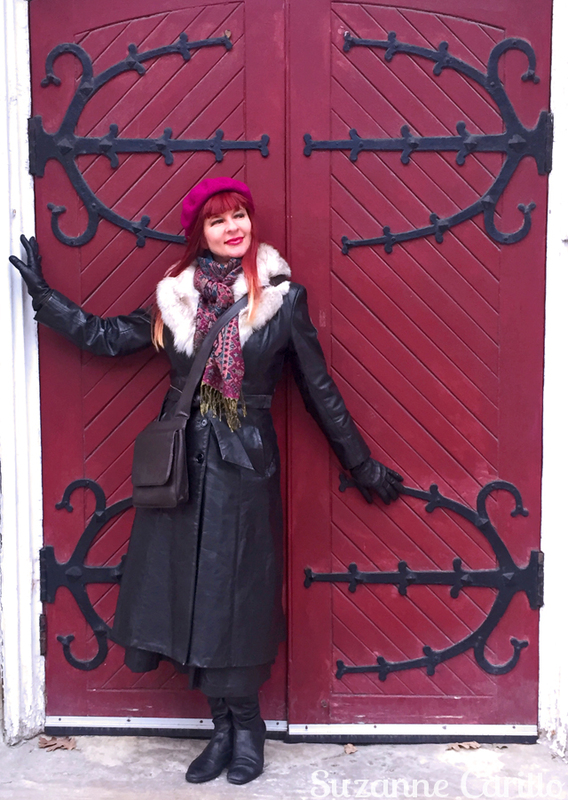 Your leather skirt is a wonderful garment and the column of color created by the boots is a trick I’ve used even when I was 5’7″+. Leather is just so delicious and I find that it is really affordable in consignment shopping. I love your brightly coloured top and clashing scarf- it’s so wild and fun! That skirt is gorgeous and so is the coat. I too have been anything but stylish since we went into the deep freeze a week ago…unless of course you count my soft cuddly leopard robe that I got for Christmas as stylish. I utterly agree that this outfit is fantastic. What a good idea to use the clashing scarf. I wouldn’t think of that in a million years. That faux fur collar on your coat is great too. Great minds must be thinking alike, as I watched The Devil’s Backbone on New Year’s Eve! I’m glad you enjoyed the exhibit. I would have liked to have seen it again (for free, now that I’m an AGO member) but am not going to have time. Love a long full leather skirt, and you’re right, the same colour boots does elongate your legs. It’s bloody freezing here too, and we are supposed to get more snow over the next couple of days. I’ve given up trying to look stylish and am piling on the scarves, hats, etc. I would be the first one in line if that exhibit came to my area because I’m fascinated by creepy, monstrous things. I chuckled at the part about moving the eyes to unexpected places in order to unnerve, as if the monsters weren’t unnerving enough already! Love the costumes from Crimson Peak too. Can you imagine how much fun it would be to have a Halloween party at his Bleak House? As far as your outfit, I can understand why you didn’t want to part with that blouse. I love it with the black leather midi skirt. I must say you do look very tall in those boots! And the comic book room is the perfect backdrop for this fabulous outfit. Also I must commend you for managing to look so chic, despite those bone chilling temps. You look amazing and Love love the exhibit. Must see if it comes to my area.